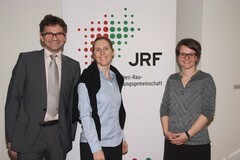 On 2 March 2016, in the framework of the “JRF vor Ort” series of events, two member institutes, DIE and BICC, invited the interested public to the lecture by Severine Autesserre "Peaceland: Why everyday practices hinder the effectiveness of peace missions". In her presentation Severine Autesserre offered a new explanation and shows how everyday practices, habits and narratives of peacebuilders have counterproductive effects. These everyday elements shape the intervention from the bottom up and reproduce ways of working that have been identified as ineffective long before: one-size-fits-all peacebuilding, expatriates living in their own bubble and dismissing local knowledge. There are, however, exceptions that could serve as a model. By following alternative modes of thinking and acting, some peacebuilders achieve remarkable results. Autesserre demonstrated the pitfalls and dysfunctions of peacebuilding on the ground and offer innovative ideas and tools to improve international interventions. Severine Autesserre is Associate Professor of Political Science at Barnard College, Columbia University. Her book “Peaceland: Conflict Resolution and the Everyday Politics of International Relations” (Cambridge University Press 2014) is based on extensive ethnographic field work in the Democratic Republic of the Congo, Burundi, Cyprus, Israel and the Palestinian Territories, South Sudan, and Timor-Leste. BICC and DIE are co-operating in the Johannes-Rau-Research Community, an umbrella organization for 15 independent non-university research institutes in North Rhine-Westphalia, established in 2014. Being part of the Community requires excellent research on issues important for the future and meeting uniform quality standards.